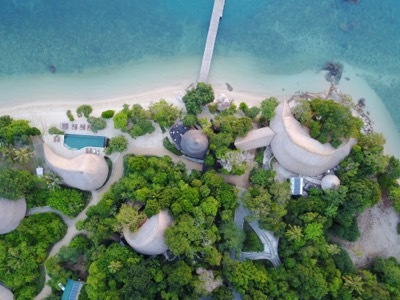 Cempedak Private Island offers conscientious barefoot luxury to the discerning traveller from nearby bustling Singapore. 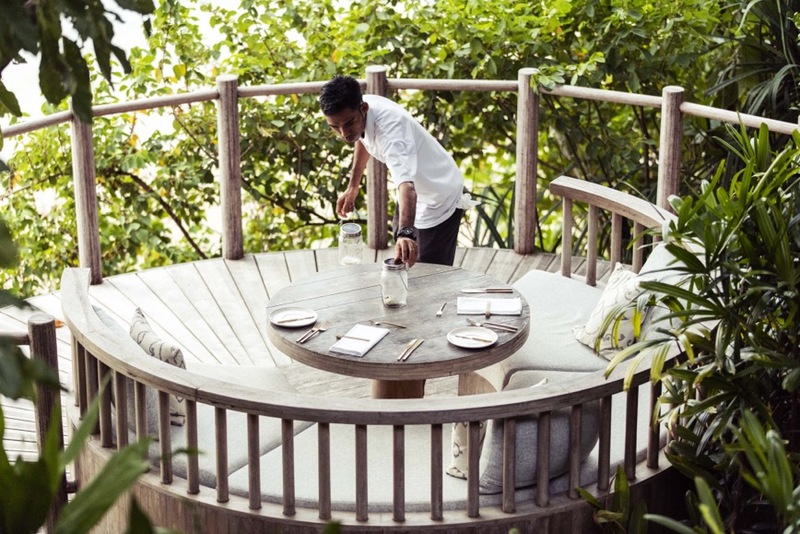 Since its launch in March 2017, the adults-only island has redefined the art of relaxed luxury with an emphasis on laudable environmental and social living practices that make it a responsible business model for the region. 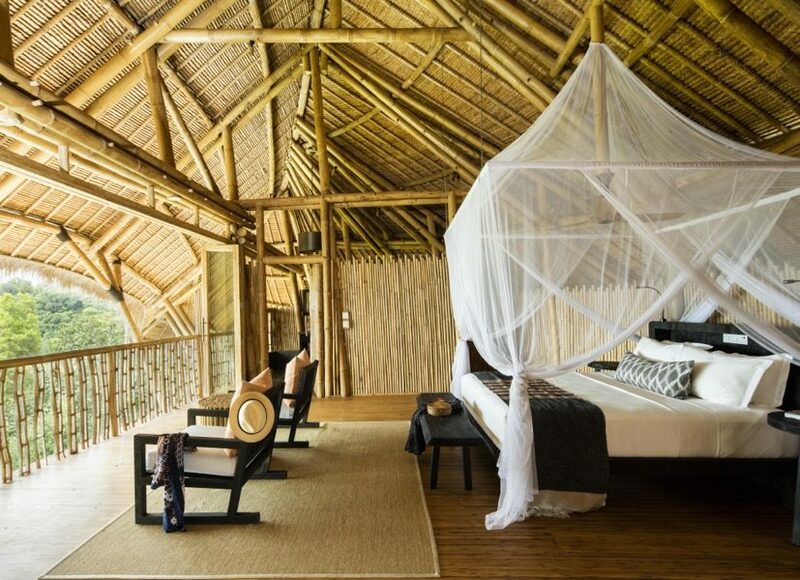 This bamboo resort nestles comfortably into its jungle island habitat offering guests beautifully appointed accommodation, complementing the natural world it rests in. 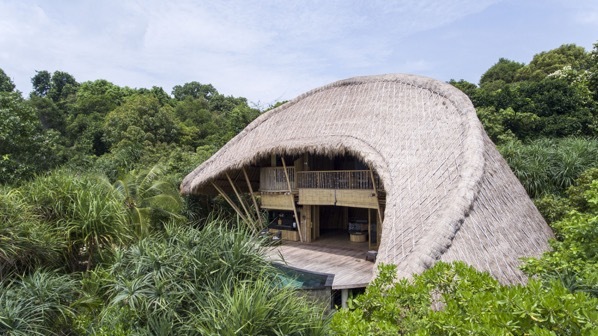 Handcrafted from bamboo with ‘alang alang’ the Cogon grass roofs are designed to promote natural ventilation, the two storey villas are over 150sqm and incorporate a spacious upstairs bedroom, an ensuite bathroom and a balcony with glorious ocean views. Downstairs showcases a spacious lounge area with an open-air deck area and a 1.3-meter deep private teardrop pool for a truly secluded experience. Cempedak offers two different types of villas; Beach and Seaview. Located just steps away from the sandy white shore, the Beach villas offer direct access to the pristine ocean, while the Seaview villas are perched elegantly on the ridge behind the beach offering views of the island. The interiors pamper guests with barefoot luxury at its very best. With vaulted ceilings, electric fans and a king size bed resplendent in luxurious organic white cotton sheets. Ensuite bathrooms have modern fittings set amongst the contrasting natural stone and bamboo textures. While the villas are free of televisions, telephones and computers, the accommodation is fully equipped with a Bluetooth speaker, excellent phone reception and Wi-Fi, should guests wish to remain connected. Officially launched in August 2018, the addition of the Rock Spa is a unique haven of tranquillity nestled on top of impressive granite boulders in an eastern mangrove bay. All three double treatment rooms overlook the ocean allowing guests to relax and restore to the sound of ocean waves on the rocky shoreline below. The Rock Spa offers unrivalled holistic, authentic treatments inspired by traditional techniques, with a focus on providing individualistic tailored experiences based on the guests’ needs. The Spa menu is divided into four distinct categories; Body Massage, Botanical Facials, Spa Journeys and Full Body Scrub. 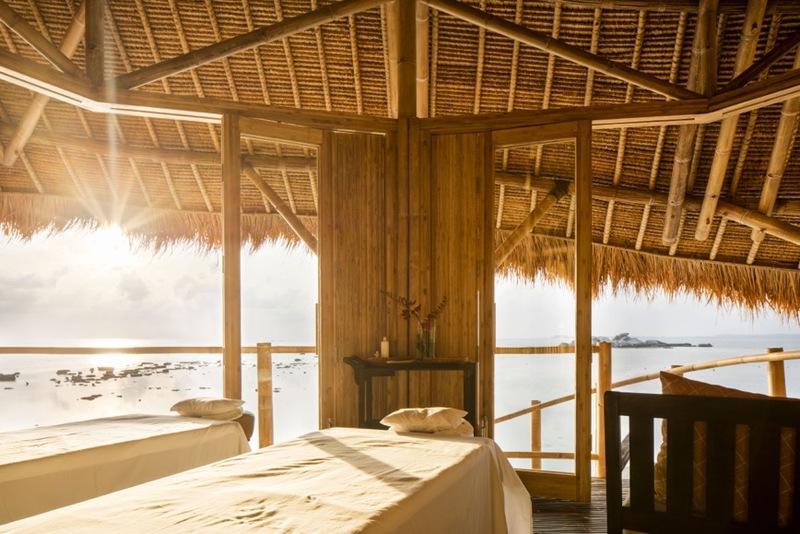 The Ocean Breeze is a beautiful lomi lomi style massage recommended for those who prefer lighter oil massage, great for insomnia, jet lag and hypertension; guests will be lulled to sleep with the rhythm of the massage like the ocean tide. The thoughtful choice of Sensatia Botanicals as the Spa product reflects Cempedak’s continuous efforts to support the local community. From the heart of Bali’s farming province, Sensatia Botanicals thrives in the natural beauty movement, committing to produce products with locally sourced and organic ingredients. From its humble beginning, Sensatia Botanicals has been actively hiring local Karangasem residents resulting in over 90% of the total number of employees. While committing to give back to the local community, Sensatia Botanicals also targets to minimise its environmental footprint and reaffirms its commitment to fight climate change. Dining at Cempedak is a journey through the region’s local produce and unique flavours. Locally sourced ingredients are transformed by Executive Chef Dika and Chef de Cuisine Bambang into a memorable culinary experience. F&B consultant Penny Williams, whose experience at London’s Savoy and the Bathers Pavilion in Mosman lends a tangible refinement to the offerings at Cempedak. The fixed menu changes daily according to the seasonality of ingredients. Cempedak buys the majority of its supplies from local markets in Bintan and small traders. Wherever possible middlemen are avoided, and locals are actively helped to establish businesses that supply fresh, sustainable and organic produce. The emphasis is on fresh ingredients prepared simply, where Barbequed seafood, local Indonesian dishes and tropical fruits feature prominently on the menu. A highlight dish that may appear frequently is the indulgent Indonesian Set, which is full of harmonious flavour combinations that showcase the vibrancy of Indonesian spices. The set includes; Ayam Bakar, Udang Sambal, Yellow Fish Curry, Beef Rendang, Nasi Kuning, Urap with Sambal Bilis Kacang, accompanied with a variety of delicious home-made Indonesian condiments. For a dish that pairs bold flavours, the Grilled giant prawn with “Nanyang” is abundant with fresh local produce. Succulent King prawns sit atop mixed rice with wild ferns (paku pakis), white cabbage with Nanyang paste, seasoned with Indonesian spices and topped off with grated roasted coconut, for a delicately balanced dish. Another stand out farm-to-table dish is the Pan-fried fish and three rice salad with “woku” gravy which showcases the diversity of local ingredients. All meals can be complemented with one of Cempedak’s signature cocktails that sees a marriage of local fusions with international flavours or by the list of carefully selected of wines available from the Cempedak wine cellar. The selection of boutique wines are hand-picked based on their farming practices, low intervention with a preference towards organic and biodynamic. The wines are stored in a temperature-controlled cellar in the dining room that is open to guests. The dynamic restaurant space showcases 180-degree views of the waterfront with private dining pods surrounding the interior for the option of privacy. Affectionately named after the taxidermy dodo that watches over guests, the Dodo Bar is famed for its inquisitive creativity at recreating classic cocktails infused with local flavours. Guests will discover the carefully curated collection of whiskey, rum and gin from boutique and craft producers. The Dodo Bar offers an impressive collection of aged Caribbean Rums along with a carefully curated selection of spirits culled from islands around the world, including bespoke whiskies sourced from Islay in Scotland. Cocktails are crafted using preservative-free homemade cordials made from the freshest local ingredients and spices. A highlight from the innovative cocktail menu includes the Limelight, featuring Paper Lantern Gin, a rice spirit based gin distilled in Singapore using ingredients from Southeast Asia. The libation is mixed with lime juice, pineapple cordial and fresh Thai basil to create a delightful balance of sweet and sour, with a herbal hint and finishing notes of caramel. For a local twist on the Pina Colada, look no further than the Yogi Colada. The tropical cocktail incorporates Santa Teresa Linaje, Venezuela Rum, orange liqueur, fresh pineapple and homemade coconut milk to deliver a refreshingly creamy concoction. There are no single-use plastic bottles on the island and the Cempedak team make their own syrups, soda water, coconut milk etc. to significantly cut down packaging rubbish. The concept of Cempedak’s activities is to provide something for everyone. Exploring the natural environment is the focus around all activities. Guests can choose from a vast array of aquatic activities including; Kite surfing, scuba diving, kayaks, island hopping, snorkelling and sailing. On land, tennis courts, croquet and boules are complemented by nature walks, which take in the lush flora and fauna as well as the rare species including Pangolins, Silver Leaf Monkeys, Sea Otters and Hornbills. Cempedak’s commitment to conservation is to ensure that not only is the environment protected, but also to guarantee that where there has been change, efforts are made to restore it. Likes its sister, Nikoi Private Island, which is constructed of driftwood, Cempedak is made from hand-picked bamboo sourced from the Indonesian Islands of Java and Sumatra. Founder Andrew Dixon explains: “We chose to build with bamboo because it is the most sustainable building material available, you can do amazing things with it in terms of design and we knew we could source it locally”. 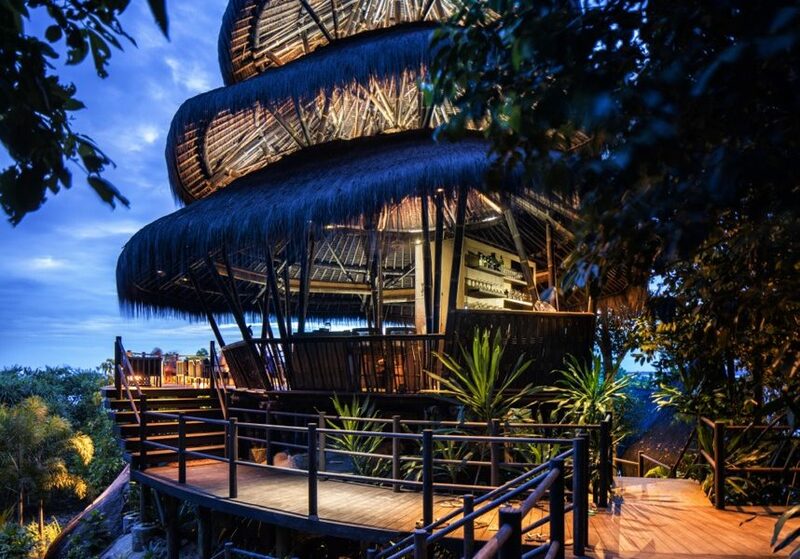 When the initial build officially began in 2014, founder Andrew Dixon, Bali based and New Zealand–born architect Miles Humphreys and the Cempedak team went to considerable lengths to reduce, recycle, reuse or upcycle any building waste. Not only was Cempedak built and is operated using local materials, labour and services, but the owners took this one step further by teaching many of their contractors and staff new trades and techniques, a passion that stems from their commitment to sharing of knowledge and creating lasting change through education which is further solidified through The Island Foundation. A short hop from Cempedak Private Island and the resorts of Bintan and Batam are the rural communities of Riau Archipelago, where villagers live with limited infrastructure and fewer opportunities to create change in their livelihoods. Meanwhile, the lack of relevant skills puts significant limitations on their life chances. The Island Foundation believes that by investing in education we can nurture the next generation by equipping them with improved numeracy and literacy skills, the confidence to solve problems and to grow. The goals of our education programme are to offer the opportunities for personal and community growth which we take for granted. It should focus on producing a lasting change in life prospects: economic success, improved health, better nutrition; and protection o the local environment. Education should create a new generation of resourceful, resilient, problem solvers who have the confidence to work in different environments and the ability to learn new skills and apply them. Overall journey time from Singapore’s Tanah Merah ferry terminal to Cempedak Island is approximately two and a half hours.